Loyalties tested, new worlds explored. Albertalli, Becky. The Upside of Unrequited. HarperAudio. ISBN 9780062417886. Read by Arielle DeLisle. digital download. 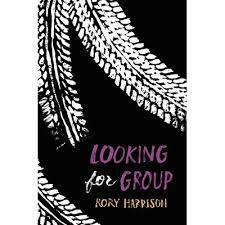 Gr 6 Up—From the award-winning author of Simon vs. the Homo Sapiens AgendaI, here is a novel about sisterhood, love, and identity, featuring 17-year-old Molly Peskin-Suso, who is an expert in unrequited love. 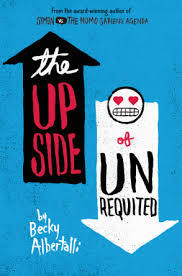 No matter how many times her twin sister, Cassie, tells her to woman up, Molly can’t stomach the idea of rejection. So she’s careful. Fat girls always have to be careful. Then a cute new girl enters Cassie’s orbit, and for the first time ever, Molly’s cynical twin is a lovesick mess. Meanwhile, Molly’s totally not dying of loneliness—except for the days when she is. Luckily, Cassie’s new girlfriend comes with a cute hipster-boy sidekick. If Molly can win him over, she’ll get her first kiss and she’ll get her twin back. There’s only one problem: Molly’s coworker, Reid. He’s a chubby Tolkien superfan with a season pass to the Ren Faire, and there’s absolutely no way Molly could fall for him. Right? Belasco, Sonia. Speak of Me As I Am. Dreamscape Media. ISBN 9781520071794. digital download. Gr 8 Up—Melanie and Damon are both living in the shadow of loss. For Melanie, it’s the loss of her larger-than-life artist mother, taken by cancer well before her time. For Damon, it’s the loss of his best friend, Carlos, who took his own life. Trying to hold on to those loved ones, Damon and Melanie take up hobbies that make them feel close to them: Damon takes pictures with Carlos’s camera and Melanie begins painting. But when these activities fail to fill the void, they both end up joining their school’s production of Othello, hoping it will serve as a distraction. In the process, they discover that it just might be possible to go on living their lives without completely letting go of what they miss. Bloom, Ira. Hearts & Other Body Parts. Scholastic. ISBN 9781536681482. Read by Lauren Irwin. digital download. Gr 6 Up—Sisters Esme, Katy, and Ronnie are smart, talented, and gorgeous, and better yet … all three are witches. They have high school wired until the arrival of two new students. The first is Norman, who is almost eight feet tall and appears to be constructed of bolts and mismatched body parts. Despite his intimidating looks, Esme finds herself strangely—almost romantically—drawn to both his oversized brain and oversized heart. The second new arrival is Zack, an impossibly handsome late transfer from the UK who has the girls at school instantly mesmerized. Soon even sensible Esme has forgotten Norman, and all three sisters are in a flat-out hex war to win Zack. But while the magic is flying, only Norman seems to notice that students who wander off alone with Zack end up with crushed bones and memory loss. Or worse, missing entirely. Brashares, Ann. The Whole Thing Together. Listening Library. ISBN 9781524709433. Gr. 6 Up—Summer for Sasha and Ray means the sprawling old house on Long Island. Since they were children, they’ve shared almost everything—reading the same books, running down the same sandy footpaths to the beach, eating peaches from the same market, laughing around the same sun-soaked dining table. Even sleeping in the same bed, on the very same worn cotton sheets. But they’ve never met. Sasha’s dad was once married to Ray’s mom, and together they had three daughters: Emma, the perfectionist; Mattie, the beauty; and Quinn, the favorite. But the marriage crumbled and the bitterness lingers. Now there are two new families—and neither one will give up the beach house that holds the memories, happy and sad, of summers past. Buckell, Tobias S. HALO: Envoy. Simon & Schuster Audio. MP3 ISBN 9781508215318. Reader TBA. Gr 5 Up—Set in the Halo universe and based on the New York Times bestselling video game series, it has been six years since the end of the Covenant War…and yet on the planet Carrow, a world on the edge of the Joint Occupation Zone, a decisive new battle suddenly erupts. Human colonists and the alien Sangheili have already been living a tension-filled co-existence in this place, with Unified Earth Government envoy Melody Azikiwe attempting to broker a lasting peace between their two species. Cotugno, Katie. Fireworks. HarperAudio. ISBN: 9780062661821. Reader TBA. Gr 7 Up—It was always meant to be Olivia. She’s the talented one, the one who’s been training to be a star her whole life. Her best friend, Dana, is the levelheaded one, always on the sidelines, cheering Olivia on. But everything changes when Dana tags along with Olivia to Orlando for the weekend, where super producer Guy Monroe is holding auditions for a new singing group, and Dana is discovered. Dana, who’s never sung more than Olivia’s backup. Dana, who wasn’t even looking for fame. The next thing she knows, she and Olivia are training to be pop stars, and Dana is falling for Alex, the earnest, endlessly talented boy who’s destined to be the next big thing. De La Cruz, Melissa. Alex and Eliza: A Love Story. Listening Library. ISBN 9780525492030. Reader TBA. digital download. Gr 6 Up—As battle cries of the American Revolution echo in the distance, servants flutter about preparing for one of New York society’s biggest events: the Schuylers’ grand ball. Descended from two of the oldest and most distinguished bloodlines in New York, the Schuylers are proud to be one of their fledgling country’s founding families, and even prouder still of their three daughters—Angelica, with her razor-sharp wit; Peggy, with her dazzling looks; and Eliza, whose beauty and charm rival those of both her sisters, though she’d rather be aiding the colonists’ cause than dressing up for some silly ball. Still, Eliza can barely contain her excitement when she hears of the arrival of Alexander Hamilton, a mysterious, rakish young colonel and General George Washington’s right-hand man. Although Alex has arrived as the bearer of bad news for the Schuylers, he can’t believe his luck, to be in such esteemed company. And when Alex and Eliza meet that fateful night, so begins an epic love story that would forever change the course of American history. Gray, Claudia. Defy the Stars (The Defy the Stars Series, Book 1). Blackstone. ISBN 9781478919445. Reader TBA. Gr 6 Up—Noemi Vidal is a teen soldier from the planet Genesis, once a colony of Earth that’s now at war for its independence. The humans of Genesis have fought Earth’s robotic “mech” armies for decades, with no end in sight. After a surprise attack, Noemi finds herself stranded in space on an abandoned ship where she meets Abel, the most sophisticated mech prototype ever made—one who should be her enemy. But Abel’s programming forces him to obey Noemi as his commander, which means he has to help her save Genesis—even though her plan to win the war will kill him. Harrison, Rory. Looking for Group. HarperAudio. ISBN 9780062661845. Reader TBA. Gr 6 Up—Dylan doesn’t have a lot of experience with comfort. His room in the falling-down Village Estates can generously be categorized as squalid, and he sure isn’t getting any love from his mother, who seemed to—no, definitely did—enjoy the perks that went along with being the parent of a “cancer kid.” His only escape has been in the form of his favorite video game—World of Warcraft—and the one true friend who makes him feel understood, even if it is just online: Arden. And now that Dylan is suddenly in remission, he wants to take Arden on a real mission, one he never thought he’d live to set out on: a journey to a mysterious ship in the middle of the Salton Sea. Haston, Meg. The End of Our Story. HarperAudio. ISBN 9780062661760. Reader TBA. 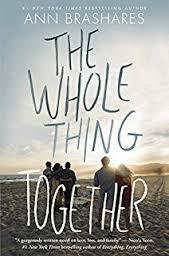 Gr 7 Up—Bridge and Wil have been entangled in each other’s lives for years. Under the white-hot Florida sun, they went from kids daring each other to swim past the breakers to teenagers stealing kisses between classes. But when Bridge betrayed Wil during their junior year, she shattered his heart and their relationship along with it. Then Wil’s family suffers a violent loss, and Bridge rushes back to Wil’s side. As they struggle to heal old wounds and start falling for each other all over again, Bridge and Wil discover just how much has changed in the past year. Although they once knew each other’s every secret, they aren’t the same people they used to be. Bridge can’t imagine life without Wil, but sometimes love isn’t enough. Maciel, Amanda. Lucky Girl. HarperAudio. ISBN 9780062398239. Reader TBA. Gr 6 Up—Rosie is a beautiful girl—and it’s always been enough. Boys crush on her, men stare at her, girls (begrudgingly) admire her. She’s lucky and she knows it. But it’s the start of a new school year and she begins to realize that she wants to be more. Namely, she’s determined to be better to her best friend, Maddie, who’s just back from a summer program abroad having totally blossomed into her own looks. Rosie isn’t thrilled when Maddie connects with a football player who Rosie was hooking up with—but if it makes her friend happy, she’s prepared to get over it. Plus, someone even more interesting has moved to town: Alex, who became semi-famous after he stopped a classmate from carrying out a shooting rampage at his old high school. Rosie is drawn to Alex in a way she’s never experienced before—and she is surprised to discover that, unlike every other guy, he seems to see more than her beauty. Poston, Ashley. 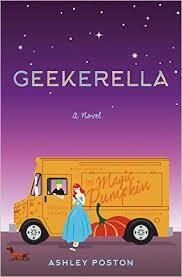 Geekerella. Blackstone. ISBN 9781455116331. Read by Eileen Stevens and Tristan Morris. Gr 6 Up—Geek girl Elle Wittimer lives and breathes Starfield, the classic science-fiction series she grew up watching with her late father. So when she sees a cosplay contest for a new Starfield movie, she has to enter. The prize? An invitation to the ExcelsiCon Cosplay Ball and a meet-and-greet with the actor slated to play Federation Prince Carmindor in the reboot. With savings from her gig at the Magic Pumpkin food truck and her dad’s old costume, Elle’s determined to win—unless her stepsisters get there first. Pyle, Howard. The Merry Adventures of Robin Hood. Dreamscape Media. ISBN 9781520068510. Reader TBA. Gr 5 Up—Pyle’s heroic version of Robin Hood begins after a conflict with some foresters leads to Robin of Locksley becoming the outlaw famous for stealing from the rich and giving to the poor. Each chapter tells a different tale of Robin as he recruits his Merry Men, resists the authorities, and aids his fellow man. Pyle’s version includes the popular stories of Little John and Robin’s staff fight, Friar Tuck’s besting of Robin, Robin’s collusion with Allan-a-Dale, and several of his conflicts with the Sheriff of Nottingham. Stohl, Margaret. Royce Rolls. Blackstone. ISBN 9781433277900. Read by Christopher Cazenove. Gr 6 Up—Sixteen-year-old Bentley Royce seems to have it all: an actual Bentley, tuition to a fancy private school, lavish vacations, and everything else that comes along with being an LA starlet. But after five seasons on her family’s reality show, Rolling with the Royces, and a lifetime of dealing with her narcissistic sister, Porsche; media-obsessed mother, Mercedes; and somewhat clueless brother, Maybach, Bentley wants out. Luckily for her, without a hook for season six, cancellation is looming and freedom is nigh. With their lifestyle on the brink, however, Bentley’s family starts to crumble, and one thing becomes startlingly clear—without the show, there is no family. And since Bentley loves her family, she has to do the unthinkable—save the show. And then things get really real. Like, not reality show real. Young, Suzanne. The Adjustment. Simon & Schuster Audio. ISBN 9781508236344. Gr 8 Up—Tatum Masterson never went through The Program. She never had her memory stripped, never had to fight to remain herself. But when Weston, her longtime boyfriend and love of her life, was taken by handlers, she hoped he’d remember her somehow—that their love would be strong enough. But what if it isn’t? 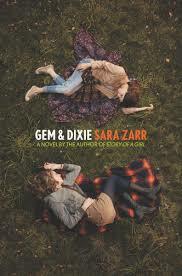 Gr 6 Up—From renowned author and National Book Award finalist Sara Zarr comes story about the complex relationship between two sisters from a broken home. Gem has never known what it is to have security. She’s never known an adult she can truly rely on. But the one constant in her life has been Dixie. Gem grew up taking care of her sister when no one else could: not their mother, whose issues make it hard for her to keep food on the table, and definitely not their father, whose intermittent presence is the only thing worse than his frequent absence. Even as Gem and Dixie have grown apart, they’ve always had each other. But Gem discovers that to save herself, she may have to sever the one bond she’s tried so hard to keep.